Ron Barceló’s Serial Drinker will leave your taste buds craving more. Just combine Ron Barceló Añejo infused with Cheerios, honey syrup and chocolate bitters to keep the thirst at bay. An easy-to-make cocktail to serve any time of the year! Pour the bottle of rum out on a container and add 2 cups of Cheerios. Let it sit for 1 day and strain back into the bottle. 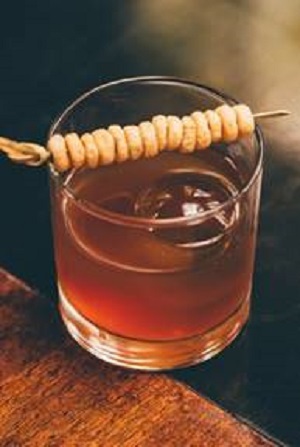 Pour 2 oz of cheerio infused Ron Barceló Gran Añejo, 1/4 honey syrup and 2 dashes of chocolate bitters in shaker. Shake vigorously and strain in coupe glass. Garnish with dry cheerios skewer. This combination of the excellent rum, the honey syrup and chocolate bitters makes my mouth water just reading the recipe!